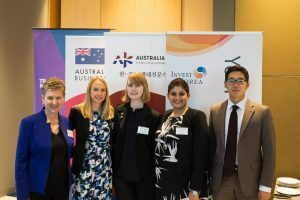 Since 1978, the Australia-Korea Business Council (AKBC) has been committed to promoting two-way trade and investment with the Republic of Korea, fostering economic cooperation and partnerships between the Australian and Korean business communities. Korea is one of Australia’s largest bilateral trading partners and the opportunities for deepened engagement and economic success are increasing. The AKBC provides its members with a forum for the exchange of the latest information on economic, financial and commercial developments in Korea and Australia. Chaired by Hon Mark Vaile AO, the AKBC works closely with senior business leaders in Australia and Korea, governments in Korea and Australia and business communities to enrich relationship, promote understanding of opportunities and ultimately, further increase trade and investment. AKBC regularly holds events, seminars and exclusive boardroom briefings to provide a forum for discussion of key issues, challenges and opportunities relating tot he bilateral relationship. The flagship event each year is the Annual Joint Meeting, held between the AKBC and our counterpart in Korea, the Korea-Australia Business Council, which is chaired by the Chairman of Australia’s single largest customer (POSCO), Dr Kwon Ohjoon. The Joint Meetings have been held since 1978 and provide attendees with the opportunity to engage in round table discussions relating to the bilateral relationship. Membership of AKBC is made up of the major corporations involved in trade between Australia and Korea and SMEs.